Howling Dog Tours EXPLORE THE CANADIAN ROCKIES BY DOGSLED! Howling Dog Tours caters to the romantic, the adventurer, the thrill-seeker, the young and old alike. Our flexibility is unmatched in the Bow Valley because of our vast Western Canadian experience in both touring and sled dog racing. Howling Dog Tours can fulfill your dreams in a way that only an experienced racing kennel such as ours can do. Two hours of dog-gone fun with great photo opportunities! 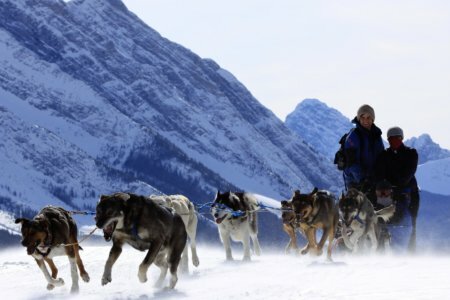 Learn why our sled dog tours are unmatched for safety, service & price in the Bow Valley. View our seasonal dogsled tour specials. View current winter trail conditions on our dog sled trail at Spray Lakes, Kananaskis Country. General information about our tours, Cancellation Policy, Payments, Weather Conditions and Waivers. Know someone who’s got everything? Give them the "Gift of Experience"! Gift certificates are available year-round!